As an grad student I excavated a Neandertal burial. Clear margins around the grave, and flexed position (fetal position), as in so many other cases. We all know about your interpretive caution, but you have to had been there to understand how clear it was. As hard as it might be to swallow, the ‘armchair’ critique that has been aimed at you must be factored. Anonymous for privacy…sorry! I suspected that this person must’ve been referring to this specimen because of the phrase ‘clear margins.’ If I’m wrong, I hope Anonymous will disabuse me of my misconception. However I’m fairly certain Kebara 2 was the specimen being referred to. In situ, it was missing the right leg, and all that remained of the skull were mandible, hyoid and an upper molar. Anyone who’s read carefully my critical analysis of this putative burial will already know the gist of what I’m about to say. I’ll try not to repeat myself. Instead, I prefer to bring forward, as evidence, a photograph that I was allowed to copy back in the late 80s, and which has always been in my back pocket, almost as a talisman against the buffetting winds of dismissal and denigration that my thoughts have received at the hands of rank and file palaeoanthropologists, including the authors of the Kebara 2 find, Ofer Bar-Yosef and Bernard Vandermeersch. This photo was first mentioned to me in a brown bag seminar I gave at UC Berkeley in my first year as a Ph.D. student there in 1988 or 89. The photographer was Yoel Rak, one of the physical anthropologists on the Kebara project, and not inconsequentially the author of The Australopithecine Face. Unfortunately it is a rather small file and doesn’t suffer much enlargement. However I think it’s sufficient to illustrate what I hope to foreground in this blurt. I was, frankly, astonished when I first saw it, because I immediately recognized the traces of solution processes that had clearly been at work in that place in the cave for quite some time. I’m referring to the numerous laminated strata beneath the partial skeleton, which I’ve delineated with red dots. Here is clear evidence of the processes that had created the traces of a 30-cm or so shallow ‘pit’ with the ‘clear margins’ that Anonymous and others documented, and to which Anon. refers in the above comment. In karst, solution of bedrock and karstic diagenesis of unconsolidated sediments is an ongoing process. In this location what I’d guess to be a source of phosphate and water had combined to produce basin-shaped depressions layer after layer through time. In fact, the only likely reason that a portion of the Kebara 2 specimen was preserved is that it came to rest in this natural depression, which would have received more rapid deposition of the sediments that contributed to the overall build-up of deposits over the centuries. What Anonymous didn’t tell you was that the ‘clear margin’ was invisible on the upslope side of Moshe [to the left in this view]. 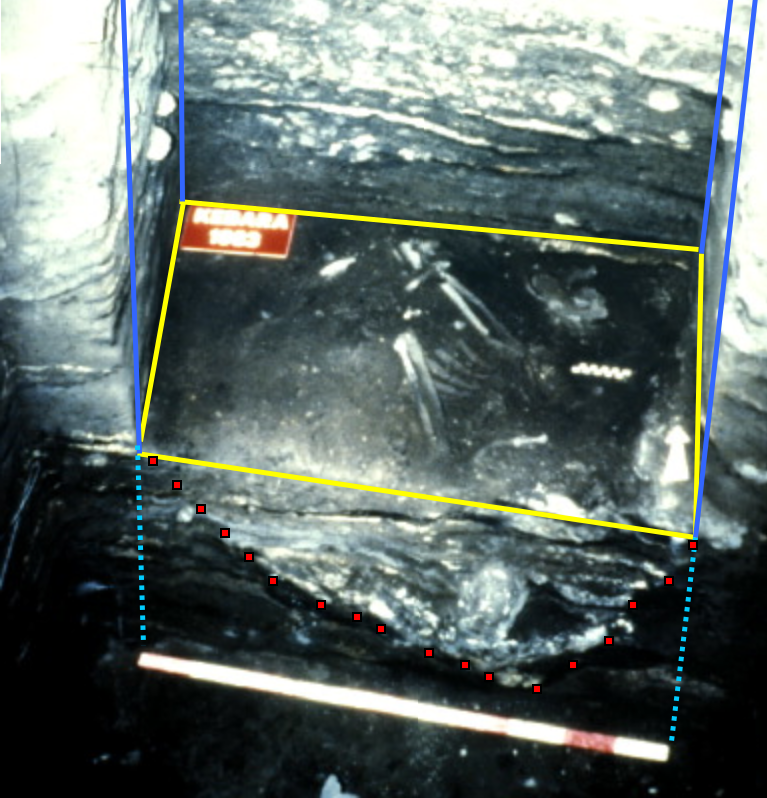 The only explanation for such an occurrence is that the natural depression, mistakenly inferred to be a burial pit, extended further to the left and ‘up’ in this view than the excavation unit in which the remains were found. On the evidence of this photo it’s clear that the ‘pit’ extended well beyond what you might otherwise expect a ‘burial pit’ to reach. I defy the excavators, and Anonymous, to explain their way out of this unacknowledged reality surrounding their discovery, the one that’s become part of the irreproachable archaeological canon of Neanderthal archaeology. In fact, I double-dog-dare ’em to reason their way out of this. Rak’s picture alone is worth any number of Roc de Marsal-style vindications to me [thanks, as always, to Denis Sandgathe, Harold Dibble, Paul Goldberg and the rest], because it is my Ace in the hole. And 21 is still Blackjack. Is it not? I don’t mean to sound smug [since that is historically the province of my detractors], but will someone, please tell me I’m wrong. Seriously. I’ll wait. I’ll be right here, waiting, until I hear back from you. But I won’t be holding my breath. Show your support for this blog. Remember that when you purchase from Amazon by clicking any of the links on, you’ll be getting great discounts and helping the Subversive Archaeologist at the same time! 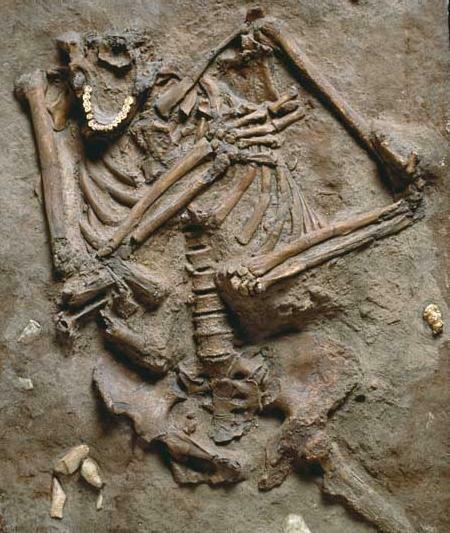 This entry was posted in Bernard Vandermeersch, diagenesis, hyoid, karst, Kebara 2, Kebara Cave, Middle paleolithic burial, neanderthal burial, Ofer Bar-Yosef, phospates, solution processes, Yoel Rak. Bookmark the permalink. Wow! The photo of the section though the basin would seem to be dispositive. And that outcome is not a surprise …. Hand-waving claims of uniquely priveleged personal experience (i.e.”you have to had been there to understand how clear it was”) are a pretty reliable indicator that reliable evidence is in short supply. @Anon. That word you were searching for. Was it….slam dunk? I like dispositive better. Thanks for dropping by. If I'm ever in old blighty I'll be sure to take one of your rock art excursions.